Here is on board filming of part of the first ever 132 mph lap of the Isle of Man, in June this year. It feels like you have hit the Fast Forward button!! Unbelievably FAST. Talk about sucking the rabbits out of the hedges! 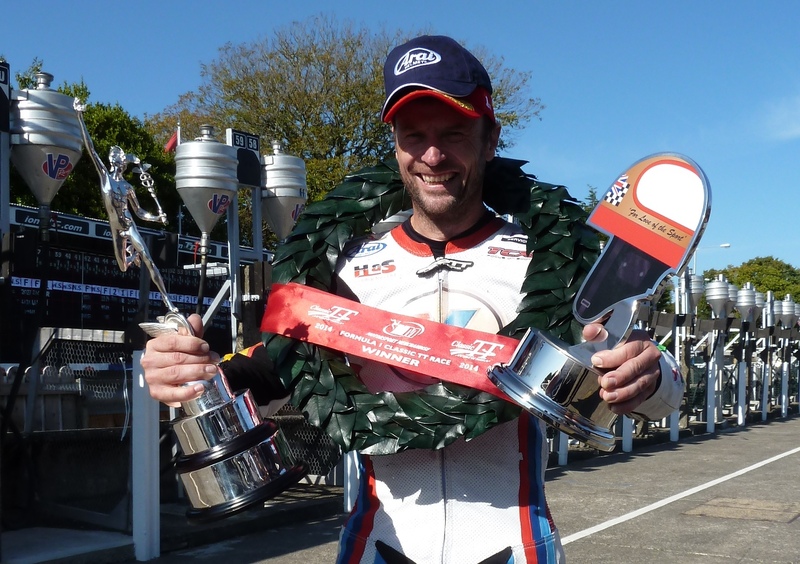 Second NZ Herald story on Bruce Anstey, Saturday 30th August. 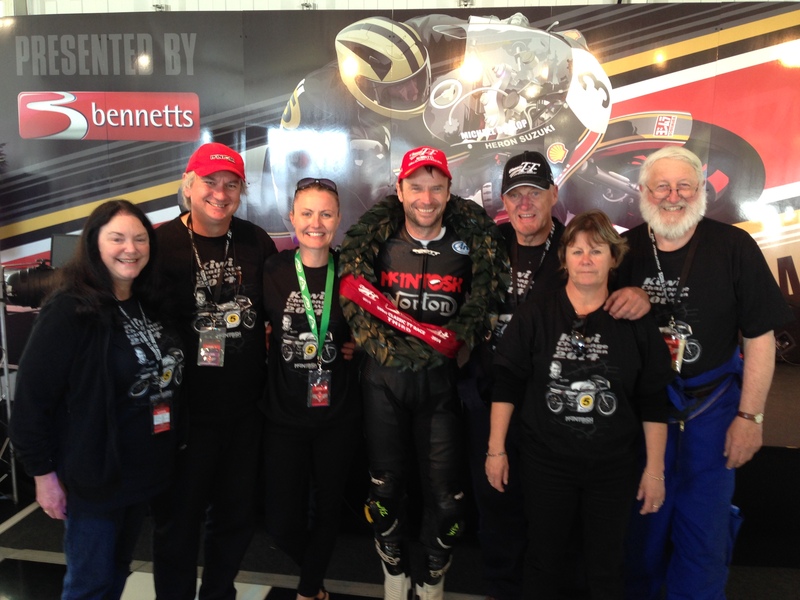 Eric Thompson has got another full page story in the “NZ Weekend Herald” on Bruce Anstey. Well done Eric! 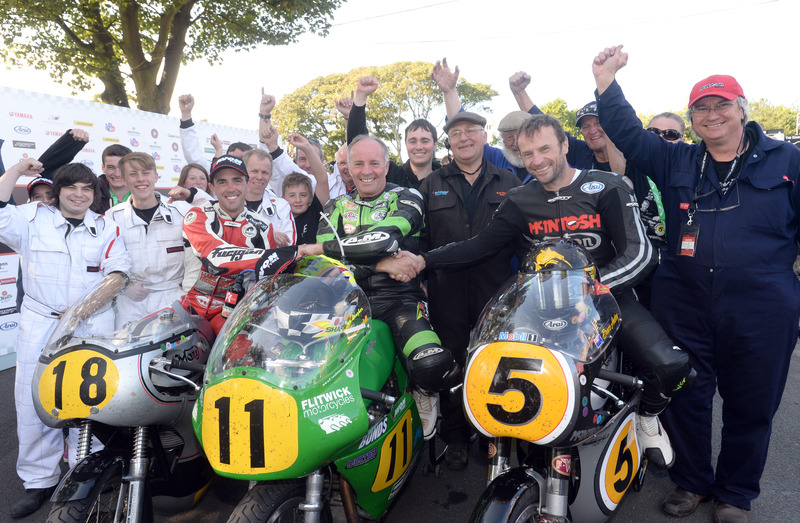 After last week’s success Bruce has now won 10 Isle of Man TT’s, because the “Classic TT” carries full TT status. 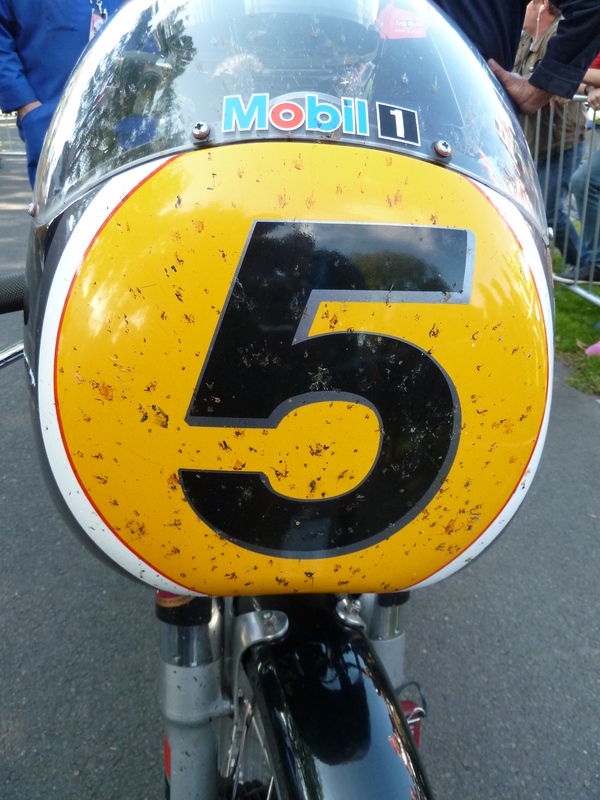 This is part of the reason why nearly all the current TT Superstars ride classic bikes, some for the first time ever. 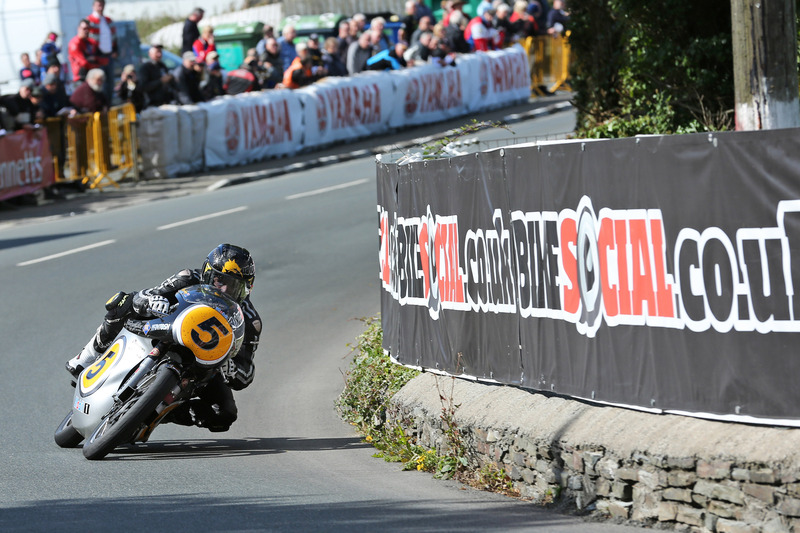 Bruce Anstey’s 108.110 mph lap was the fastest lap by a Manx Norton, in GP1 or GP2 class. This was using a Summerfield 92 bore motor, running on VP98L petrol. 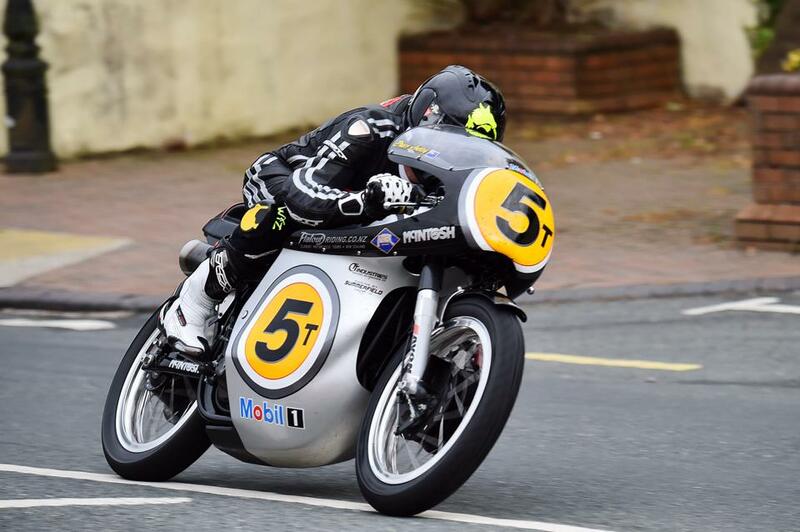 The bike weighs 142 kg, the standard Manx Norton weight. Fred Walmsley’s 98kg Seeley G50 (GP1 class) lapped at 109.103 to set the fastest ever lap by a single in GP1 or GP2 class, but broke on the 3rd lap. 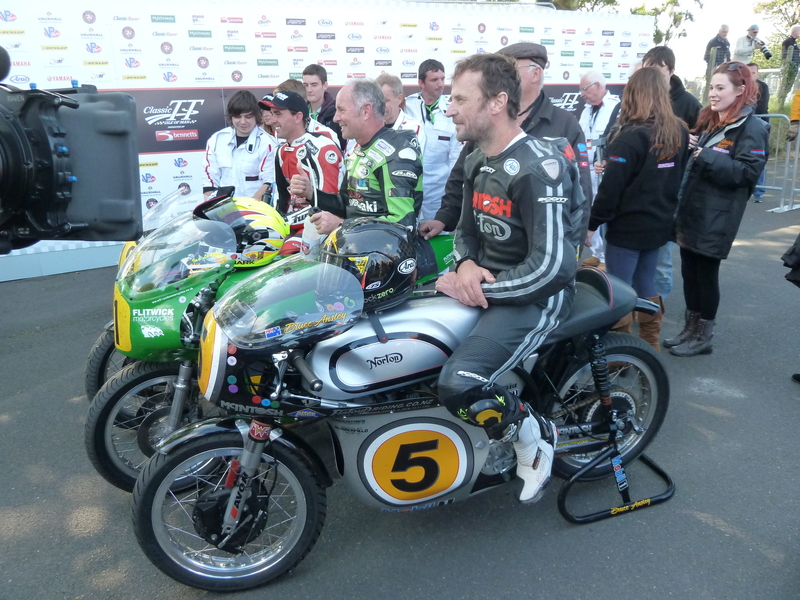 This is the same bike Cameron Donald rode last year, retiring with a cracked crankcase. Andy Molnar’s second placed 4 valve Manx (GP2 class) which revs to 10,000 rpm and makes a claimed 70 bhp has never lapped as fast as Bruce Anstery’s Summerfield engined 2 valve McIntosh Manx. 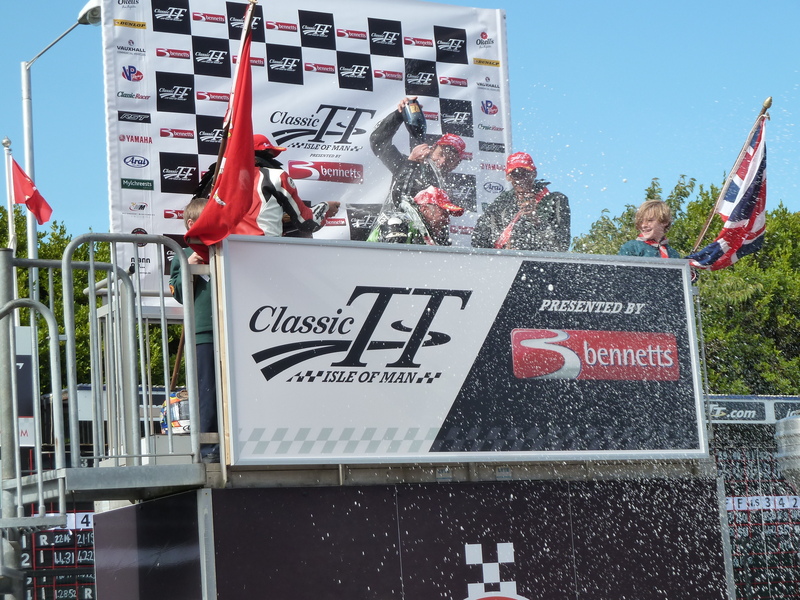 New Zealander Bruce celebrates his TENTH Isle of Man TT victory after winning the Classic TT F1 Race riding Clive Padgett’s 1992 500cc V4 Grand Prix Yamaha and breaking the Lap Record. 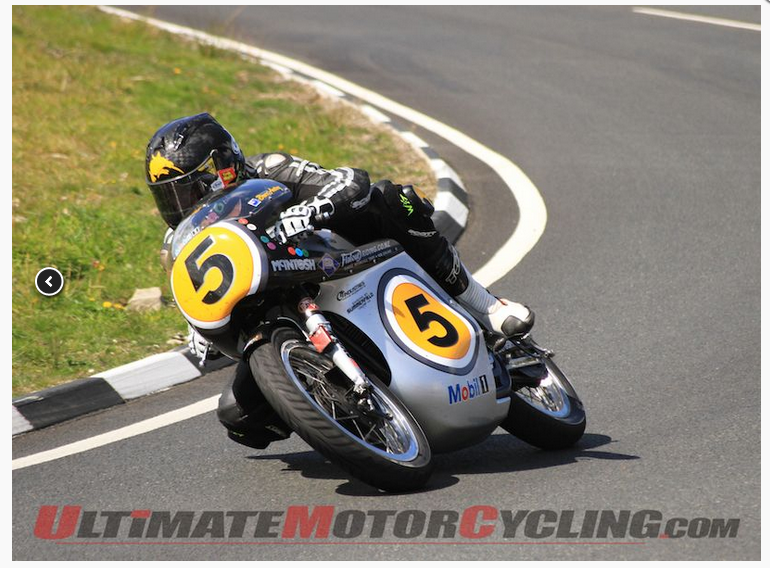 He is also holding the prestigious Mike Hailwood Trophy for being the first single cylinder bike in the pre 1972 500cc Classic TT held on Saturday, riding the New Zealand built McIntosh Manx Norton. No headaches after the post race celebrations! Our little team had a very happy evening celebrating with Bruce, Anny and Clive Padgett. After the race on Saturday the whole team were taken to the hospitality centre by Milky Quayle where free drinks were supplied to us all. The TT organisers have really gone out of their way to make us feel welcome. People have asked about Bruce winning the Hailwood Trophy which is awarded for the first single cylinder bike. 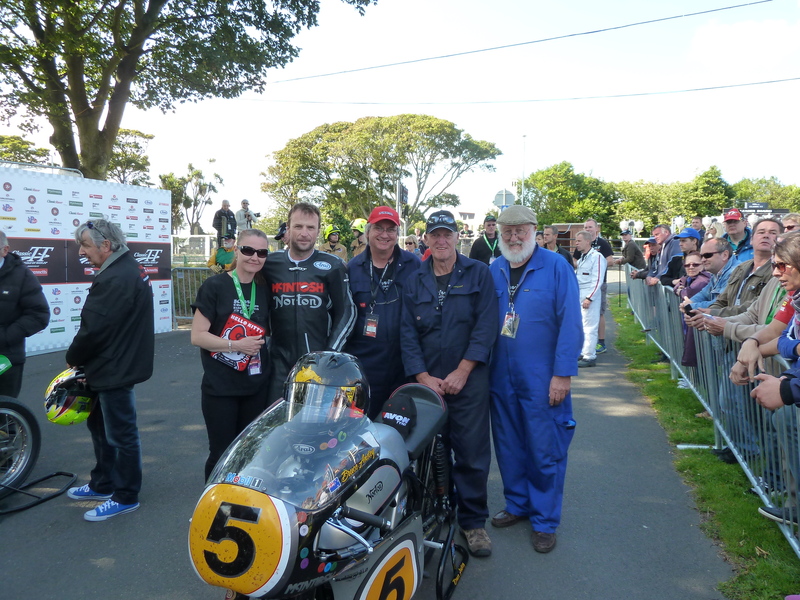 The 2nd placed single cylinder Molnar Manx was not eligible for this award as it has a non-period 4 valve head which it is only allowed to run here on the Isle of Man. Under a dispensation it runs in the GP2 class for multi-cylinder bikes. For Bruce to get on the podium was a double bonus. Sunday arrived with beautiful weather. The Vintage Motorcycle Club Festival at Jurby Airfield and as it has about 20,000 people attending we thought it a good place to arrive late! 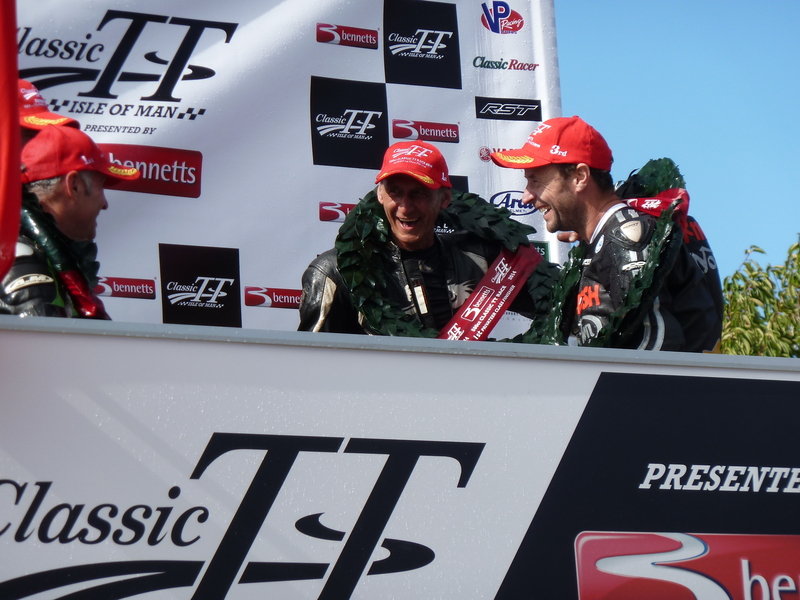 We took the two bikes to display and met a lot of people who had cheered Bruce on from around the circuit. They were all impressed with his immaculate lines through the corners, and how good the bike sounded. The Summerfield motor never missed a beat. 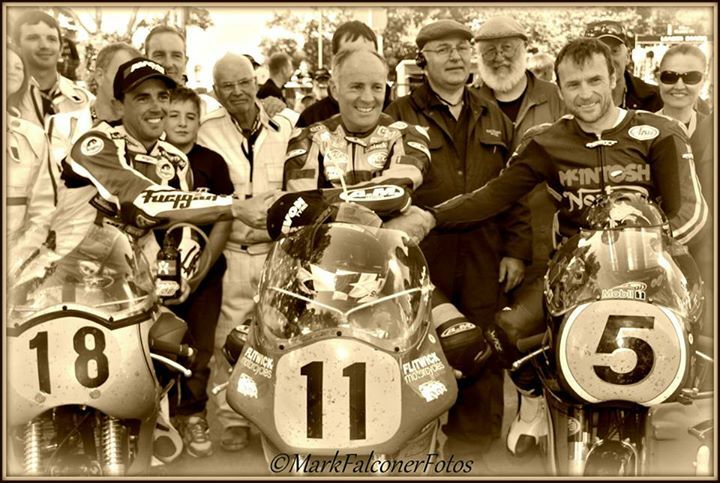 On Sunday evening Debbie and I were invited to the Classic TT Heroes Dinner where Niall McKenzie, Carl Fogarty, Croz and John McGuinness were all on stage with Neil Hodgson, who interviewed them about there experiences with Joey Dunlop. They were all full of praise for the man who won more TT’s than any other rider but also drove a van full of supplies to Bosnia for an orphanage during the Balkans War without any fanfare. Michael Dunlop also spoke of his experiences of switching from Honda to BMW and was very forthright! 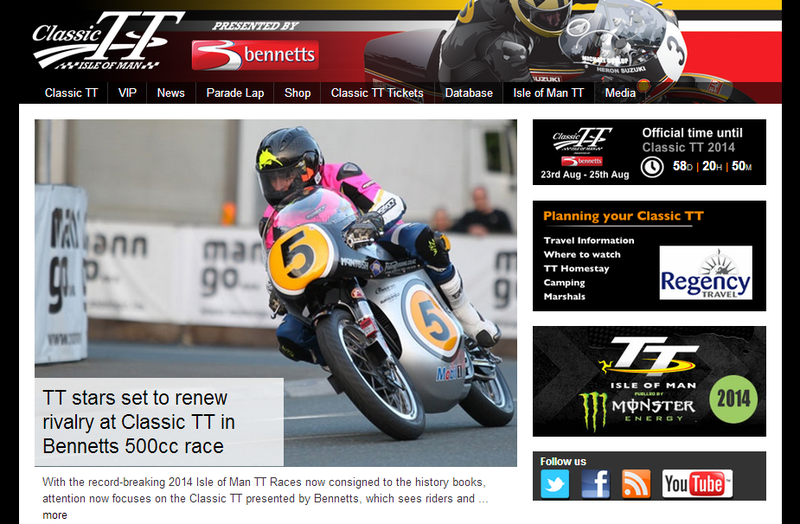 We sat with Malcolm Wheeler, the editor of Classic Racer magazine who was a TT winner himself. He told me Classic Racer is almost unique in it has bigger overseas sales than UK. I told him it was even on sale at Dubai Airport. We also had Ferry Brouwer at our table, who sent the V4 125cc Yamaha to NZ for Hugh Anderson to ride. He disbanded his historic Yamaha team last year and has retired from classic racing and is enjoying his first “real” retirement. Charlie Williams who won 8 x TT’s in the 1970’s was very nice to talk to and is learning to sail a yacht . 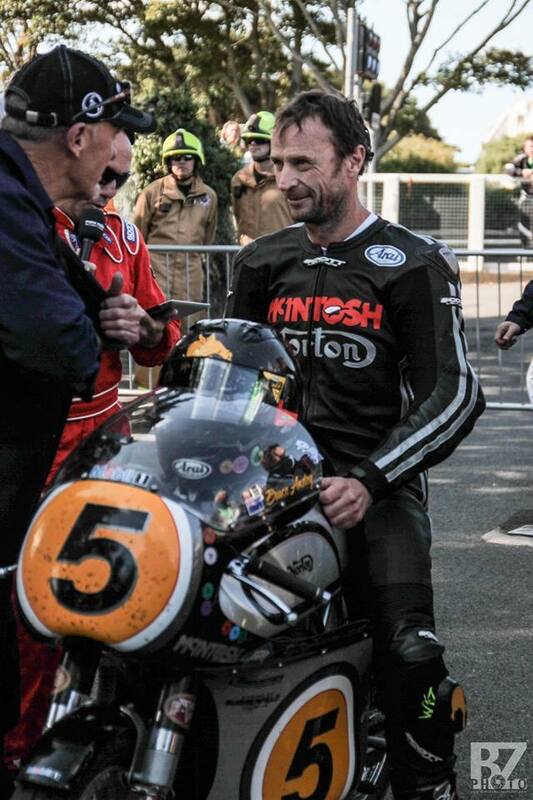 He had a good ride in the Classic TT this year after a long retirement. The weather this morning is overcast and not expected to clear. The 350cc Classic Race and the Formula 1 Race (Bruce to ride the Yamaha 1992 V4 GP bike) are due to run but may be delayed until tomorrow.